How afraid should investors be of the end of quantitative easing? Judging by recent comments, but also by the markets’ reaction until now, not too afraid. The Federal Reserve was the first to embark on the nonconventional policy and is the first to exit, but so far bond yields have been surprisingly tame. Some investors worry that this means that a “moment of reckoning” would bring violent swings in asset prices as markets try to re-price the effects of “quantitative tightening” — as the process of winding down the Fed’s asset purchases has become known. In a recent working paper published by the International Monetary Fund, Tim Willems looked at what happened in the past when monetary conditions tightened and found that an interest rate hike of one percentage point typically reduced real gross domestic product by 0.5%. Advanced economies suffered more when monetary policy tightened, with real GDP falling by around 1.1% after a one percentage point hike in interest rates, compared with just 0.3% in developing countries. But things may not be that bad this time. Central banks are far from tightening monetary policy at a pace that could do that kind of damage. 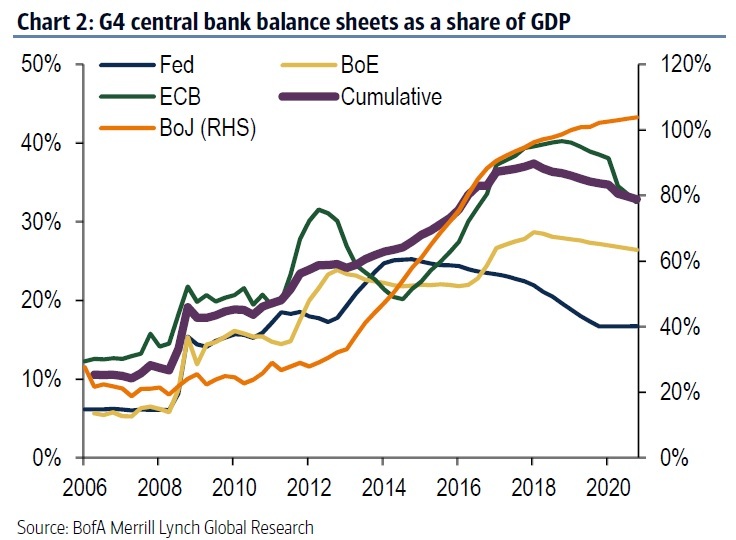 Analysts at Bank of America Merrill Lynch have estimated the size of the balance sheets of the world’s main four central banks in the next couple of years. Central banks balance sheets are more than half their countries’ GDP. It is quite obvious that the central bank policymakers will not bring their balance sheets back to the pre-crisis levels any time soon. As the analysts note, the Fed is raising interest rates at half the normal exit speed, the European Central Bank is promising to keep interest rates low for longer, while the Bank of Japan is sustaining yield curve control for the indefinite future. As for the Bank of England, it has been pulling back from the brink when it came to raising rates so many times before, that everybody now believes “the unreliable boyfriend” will remain on the dovish side forever. “All of the major central banks are likely to maintain very large balance sheets for the foreseeable future and even the Fed is expected to stop shrinking its balance sheet next year and then let it grow in line with the economy thereafter. Overall, the aggregate G4 balance sheet is projected to decline by only 4% by the end of 2020,” the Bank of America Merrill Lynch analysts said in their report. With no reason to be afraid of monetary tightening, markets will need to look elsewhere for fear triggers. Trump’s trade war and Britain’s no-deal Brexit are just two of these. This entry was posted in News, Views and tagged Bank of England, Bank of Japan, central banks, ECB, European Central Bank, Federal Reserve, interest rates, monetary policy, money printing, quantitative easing on September 30, 2018 by Antonia Oprita. CECILE DOUNY « En réalité depuis l’an 2000 la masse monétaire a fait x 6 » Il faudrait le vérifier mais il me semble que la FED ne publie plus la masse monétaire M3 depuis le 23 mars 2006soit depuis 12 ans !! A mon avis, cette décision dopacité a pour objectif de masquer lénorme bulle monétaire que constitue le dollar. Sinon, quel intérêt aurait la FED à cacher ce chiffre ? Jen déduis quil est malheureusement fort possible que vous soyez en dessous de la vérité, avec une estimation de x 6. En 12 ans, avec les Q.E. et les taux au plancher, la planche à billets de la FED a dû fonctionner ! Et depuis quelque temps, la FED remonte les taux et stoppe ses Q.E. pour dégonfler sa propre bulle monétaire. Jai la nette impression que cela va très mal finir.